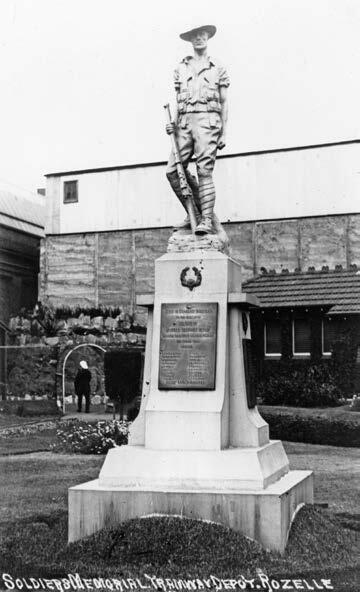 The War Memorial at Rozelle Tramway Depot which was one of the memorials erected by the NSW Government Tramways. 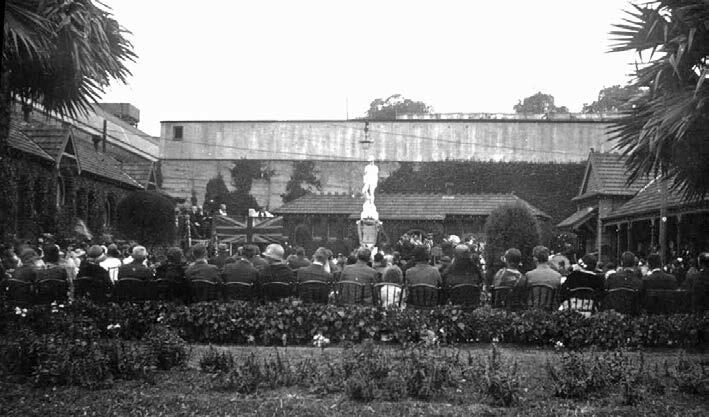 Yesterday afternoon official regulations were relaxed at the Rozelle Tramway Depot, and visitors were allowed to witness the unveiling of a war memorial in the form of a statue. Seats were provided on the well-kept lawn tho centre of which the monument to Rozelle tramway men, who have fallen, was covered hy a Union Jack. Wreaths were placed at the base of the monument. Sixty men of the Rozelle Depot formed a guard of honour, and tho Massed Tramway Inter-Depot Bands were in attendance, under Bandmaster K. Davidson, and tho secretary, Mr. T. M’Master. Mr. W. Phillips, Depot Master, presided and on tho improvised platform were Mr. T. Keegan. M.L.A., Military Chaplain, tho Rev John Boardman, Mr. E. J. Doran (Tramway Traffic Superintendent), Mr. C. H. Neale (Assistant Tramway Traffic Superintendent), Mr J. Hermann (Outdoor Superintendent), Mr. H. Mark (District Superintendent), Mr. T. Perk (District Superintendent). Mr. J. M’Cartly (President of the Tramway Union), Mr. Heydon (Depot Master, Dowling-street), Mr David Ford (hon. secretary Rozelle Tramway Monument Fund), Mr. Claude Thompson (secretary Railway and Tramway Service Association), and others. The chairman said he was sorry that the Governor was not able to unveil the memorial. He had received a lotter from his Excellency expressing his regret, and letters of apology from tho Chief Commissioner, Mr. Fraser, tho Commissioner for Tramways, Mr. Milne, and the Secretory for Railways, Mr. Spurway. Tho memorial was in honour of six men who had given their lives for Australia while fighting under tho Union Jack. There were 150 of the Rozelle depot men at the front, and many others had volunteered. Altogether over 900 men from tho traffic branch of the Tramway Department had enlisted. The monument had been designed and executed by Mr. E. M’Gowan, a young sculptor, now resident in Sydney, who was a King’s Prize-winner at South Kensington, and tho winner of the Taylor Art Scholarship at Dublin. Tho unveiling ceremony in which Mrs. Doran was assisted by Mr. Keegan, M.LA., showed the figure of an Australian soldier just having fixed bayonets. Tho inscription on the front tablet is as follows:- “Glory to God. Honour to the dead. To the memory of the men of Rozelle tramway depot, who gave their lives for their country in the Great War, 1914-19-. Erected by their comrades.” The names on the tablet are G. V. Sandilands, W. G. Robertson. H. Chadwick, F. Beck, T. A. Stewart, and J. G Bell. 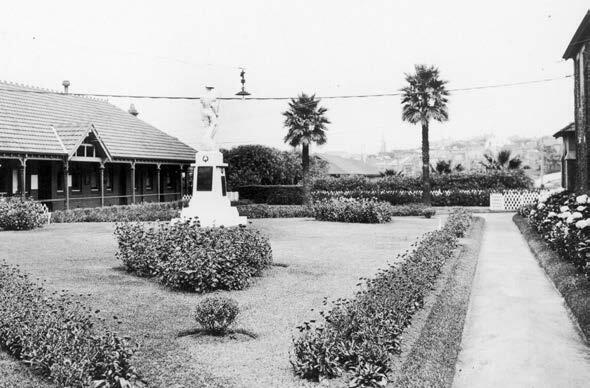 The Rozelle Depot War Memorial (left) and (below) a rear view looking towards the front of the Depot. 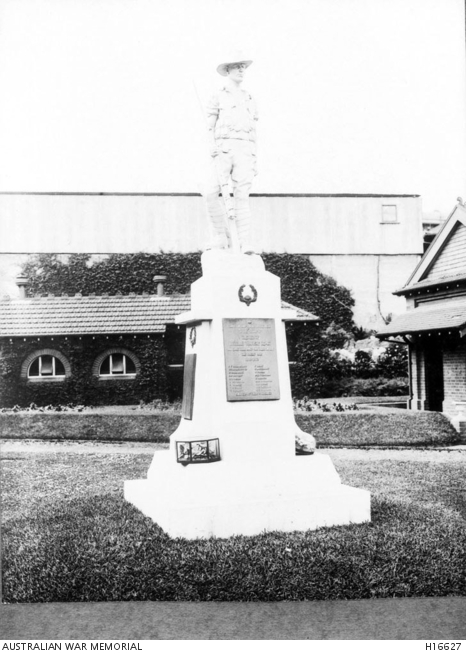 The War Memorial remained at the depot after the trams ceased, and was eventually relocated to Leichhardt Bus Depot, where it has undergone refurbishment.